Our plumbing company got back to us right after they opened on Monday morning. Initially they didn't think anyone could come out until Wednesday, but after a bit of schedule reshuffling, Steve-our-regular-plumber was able to come up to Fernley on Monday afternoon, for which we are most grateful. The actual pipe with the pin-hole leak in it was a galvanized steel pipe leading to the pressure relief tank. Steve recommended (and we agreed) that he replace the pipes with brass ones. 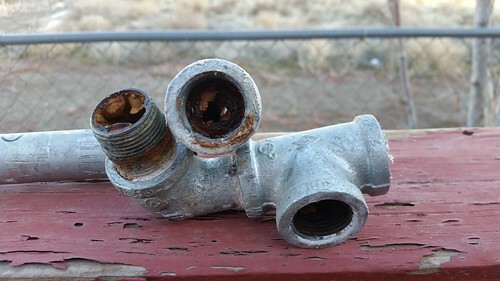 Here's what some of the removed pipes looked like. Wow, there was sure a lot of crud built up in these pipes! 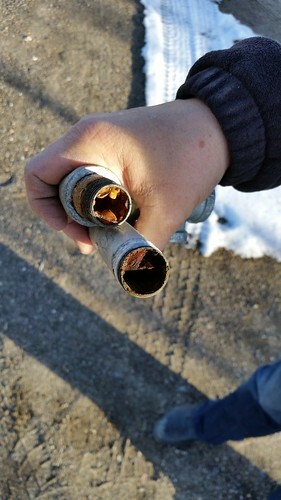 The lower of these two is the actual pipe that started leaking. It's unlikely that the build-up of junk in the pipes actually caused the leak, though. It was most likely just a defective pipe. Here's the result, with the new brass pipes. The flexible pipes on the top layer were the existing feed lines to and from the tank. The gray line in the middle is the electrical feed. The new pipes connecting to the blue pressure relief tank are the bottom layer. We turned things back on after Steve fixed the pipes. (There was still slightly-warm water in the system after more than two days turned off, which says good things about the tank's insulation.) No more leaks. There was still water in the overflow pan under the heater, but that seems to have been the result of the slow leakage from the pinhole running all around the sides of the heater and pooling underneath it. This might take a little while to work itself out. 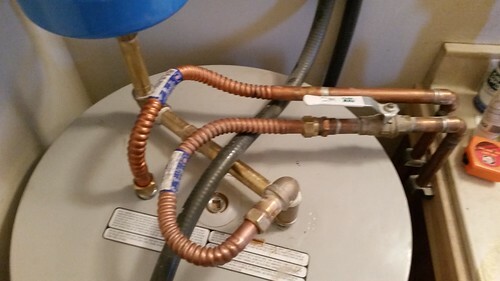 The repairs cost $350 including parts, but we have hot water again, and that's a relief.